To be OFFERED AT AUCTION at RM Sotheby’s Monterey event, August 18-19, 2017. As with any automotive manufacturer, and particularly Aston Martin and its V8, a number of rolling changes were incorporated into production over its nearly 20-year lifespan. These were very much hand built cars, built-to-order, and after the upgrades and proper tests were completed, only then could they be delivered to their deserving customers. Eight cars were built for the Canadian market with Vantage-type cosmetics: Front air dam, plugged bonnet bulge, and rear ‘Fliptail’ spoiler . . . . The engines were to European Stage 1 specification (indicated by the suffix ‘S’ in the engine number) and the chassis number suffix LCA. Four cars were manual [including 11904] and four were automatic. These cars have been dubbed ‘Canadian Vantages’ . . . while technically not factory Vantages, the term differentiates them from the standard specification cars. Even so, the carbureted ‘S’ V8 Canadian delivery cars offered higher performance from new over their Stateside counterparts. 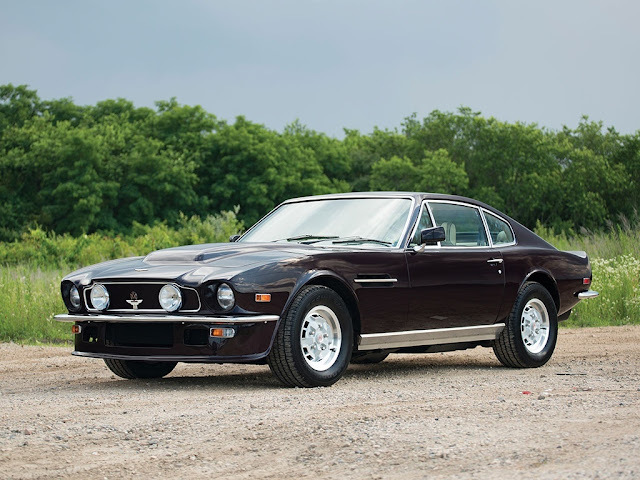 Constructed in March of 1978, this V8 was delivered new through Grand Touring Automobiles in Toronto, owned by Canadian entrepreneur George Minden, who was a partner at the time in Aston Martin Lagonda Ltd., UK. This interesting car was sold new to a customer in Vancouver, British Colombia. It was later acquired by another Canadian, who kept the V8 at his residence in Palm Desert, California. The car was eventually acquired by Rogers in 1999, who refinished it in an elegant burgundy called Royal Cherry and sympathetically restored it as necessary. Mechanically, the car received a full brake system overhaul, new clutch assembly, rebuilt water pump, plus a carburetor rebuild, and more. This has all held up admirably, attesting to the quality of the work. The nice original interior remained largely as-found, save for re-padding the Fawn Connolly leather seats, installation of new Wilton carpets, and Fawn wool headliner. During the restoration, it was noted that the chassis was inspected and that there was no corrosion found, while the paint selected contained an epoxy rust preventative. The car was later sold to an Aston Martin collector on the East Coast. In April 2005 during an annual service, the car received an engine rebuild and was converted to six-liter “big bore” specification, utilizing authentic Vantage components supplied by the UK-based specialists at Aston Engineering. This improvement in displacement develops massive horsepower as well as useful torque that exceeds factory Vantage specification and makes for quite an exciting drive! Over the course of the last decade, the car has been serviced and maintained on a regular basis by Autosport Designs of Huntington Station, New York, and stands ready to rev-up, drive, and enjoy.